dave rhea - Phillips Murrah P.C. Phillips Murrah is proud to announce its inclusion as one of Oklahoma City’s Top Workplaces for the fourth year in a row. The Oklahoman newspaper published their annual list of Oklahoma’s Top Workplaces on Dec. 10 ranking the Firm No. 20 out of 40 in the small employer category (fewer than 125 employees), up one spot from last year. The Firm was first named to the Top Workplaces list in 2015 and moved up the list in 2016 and 2017. In determining the defining criteria of Top Workplaces, The Oklahoman partners with the Philadelphia-based company, Energage, which evaluates companies across the country, pertaining to internal components of healthy workplace dynamics. Every year, the newspaper encourages local participants in Oklahoma City to nominate businesses for the program. The methodology of candidate evaluation is determined from anonymous surveys, detailing employee satisfaction, company values, internal communication, leadership and other various determinates. 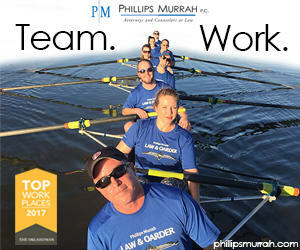 To learn more about the workplace culture and opportunities at Phillips Murrah, visit our Careers page: http://phillipsmurrah.com/careers. Gavel to Gavel appears in The Journal Record. This column was originally published in The Journal Record on October 25, 2018. Dave Rhea is the Marketing Director for Phillips Murrah law firm. What is brand affinity? What is SEO? Many attorneys admittedly don’t know much marketing jargon. Historically speaking, marketing is a relatively new addition to the legal industry. Only 41 years ago, the U.S. Supreme Court recognized lawyers’ right to advertise. From what I understand – as a non-attorney working in a large law firm – law schools don’t offer many, if any, classes about marketing methods. Thus, these activities can seem as impractical to lawyers as dancing does to steelworkers. However, in today’s digital landscape, it’s reasonable for attorneys to consider adopting a marketing mindset. Technology, coupled with the growing inclination of law firms to onboard marketing professionals, allows attorneys to easily demonstrate their expertise to a much wider audience while sacrificing fewer billable hours. What can attorneys do to develop more business in the digital age? There are numerous ways to leverage new media to effectively enhance one’s visibility and reputation in the community, but for this column I would like to concentrate on one such activity, in particular. The biggest bang for the non-billable hour is thought-leadership authorship. Writing short-form articles on a consistent basis for publication on the firm’s website, or blogging, is an easy way to position oneself as an industry leader. Such articles can have a long shelf life and are versatile in how they can be disseminated. This activity also allows for exposure outside of the attorneys’ usual circles of influence while building a body of work that increases their digital footprint, which allows the attorney-authors and their firms to be found more easily on Internet search engines. Savvy, marketing-minded author-lawyers can also use such articles to heighten awareness and demonstrate excellent customer service to their clients and prospects. Using direct outreach via one-to-one email, these attorneys can show proactive attention and demonstrate knowledge of the targets’ industries, thereby harnessing a proven way to nurture relationships and win new business. Old-school rainmakers with existing books of business and established reputations may not view blogging as a beneficial use of their time. However, many of these key influencers still understand the benefit of developing a marketing-mindset culture within their firms and go the extra mile to promote buy-in from junior partners and associates. 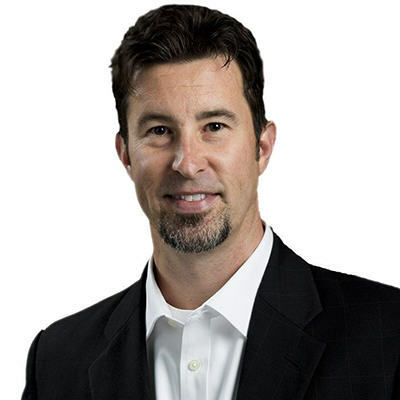 Dave Rhea is marketing director at the law firm of Phillips Murrah in Oklahoma City. 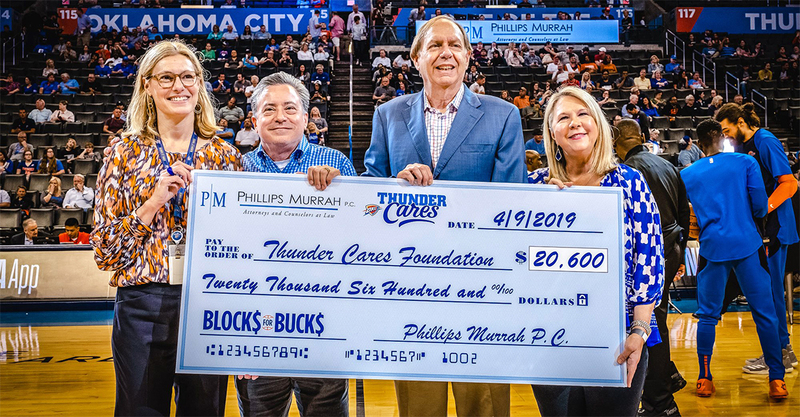 Today (Oct. 16) marks the beginning of the 2018-2019 NBA regular season, and that means Phillips Murrah is cranking up our second year of partnering with the Oklahoma City Thunder’s philanthropic organization, the Thunder Cares Foundation via our Blocks for Bucks campaign. Russell Westbrook on @okcthunder Instagram. As a part of the Firm’s partnership with the Thunder, the Phillips Murrah logo is featured on the Chesapeake Energy Arena platform signage, which can be seen in the background. The Thunder Cares Foundation helps support the team’s community outreach projects, including Thunder-themed basketball courts in parks, schools and community centers across Oklahoma, as well as learning labs and activity rooms at organizations like the Boys and Girls Club of Oklahoma County, City Rescue Mission and Positive Tomorrows. Phillips Murrah began a our partnership with the Thunder Cares Foundation on Nov. 22, 2017, which was the the first match-up of the season against the Golden State Warriors. The video clip below of one of KD’s shots getting blocked is an example of the highlights featured on the Blocks for Bucks landing page, featured on the OKC Thunder website. The Blocks for Bucks landing page also features updates throughout the season that include a Blocks Counter and a total amount of funds raised. During the course of the 2017-2018 season, Blocks for Bucks raised $17,000 to benefit the Thunder Cares Foundation. On April 11, 2018, the final game of the regular 2017-2018 season, representatives from Phillips Murrah participated in a check presentation ceremony at center court in the Chesapeake Energy Arena prior to the game. The total amount presented to the Thunder Cares Foundation includes the total leading up to the final game that appeared on the check, $16,700, plus the amount for three blocks that occurred during the game. 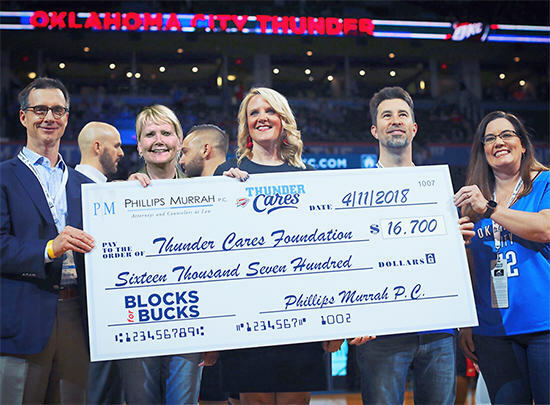 On April 11, 2018, Phillips Murrah President Tom Wolfe, Executive Director Michelle Munda, Marketing Director Dave Rhea and Controller Stephanie Oseland present the Blocks for Bucks check to Erin Oldfield, OKC Thunder Community Relations Director. Phillips Murrah Marketing Director Dave Rhea and Attorney Bill Price welcome the four Cristo Rey students who will be working with the Firm during the 2018-2019 school year. 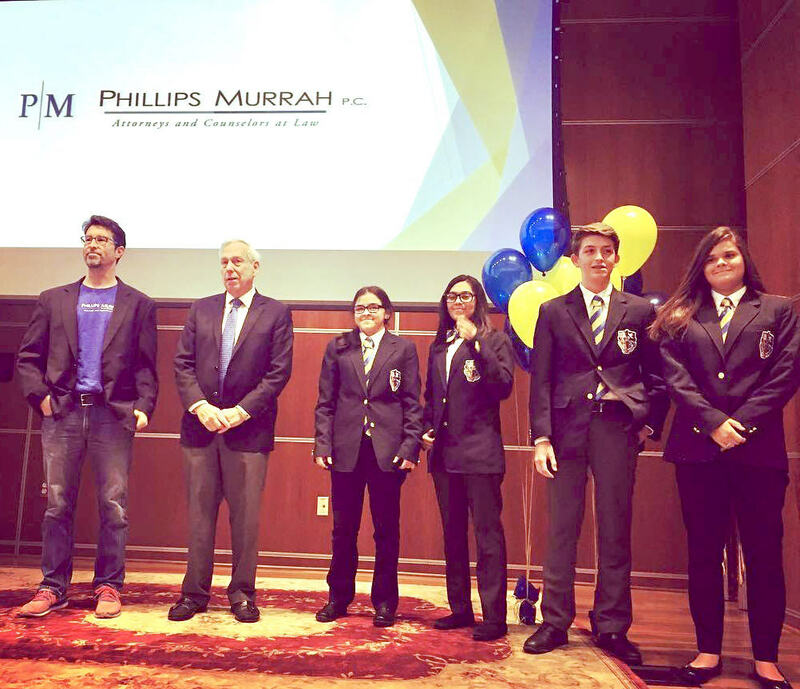 Phillips Murrah law firm is proud to sponsor the inaugural freshman class of Cristo Rey Oklahoma City Catholic High School. Students in the school’s Corporate Work Study Program will begin working with the Firm in a variety of capacities on Aug. 13. Four students will alternate working with the Firm each day in general clerical and administrative matters. The team of students “job share” the position for the school year with each student working one full day per week plus one Friday per month. Academic schedules are staggered so students won’t miss class due to work. As part of the school’s Corporate Work Study Program, students get valuable work experience in addition to a salary that is used to support their tuition and minimize costs for families. Phillips Murrah joins a long list of Corporate Work Study Partners including: American Fidelity, Archdiocese of Oklahoma City, BancFirst, Catholic Charities, the Chickasaw Nation, Clements Foods, Express Employment Professionals, First National Bank of Oklahoma, Grace Living Centers and Humphreys Capital, Latino Community Development Agency, Lopez Foods, Loves Travel Stops & Country Stores, McBride Orthopedic Hospital, Mercy Health, Oklahoma City National Memorial, Oklahoma City Thunder, Oklahoma Medical Research Foundation, The Oklahoman, Slawson Exploration, Stella Nova Cafes, Synergy Datacom Supply, United Way, Variety Care and Weokie Federal Credit Union. Cristo Rey’s Oklahoma City chapter is part of Cristo Rey Network, the only network of high schools in the country that integrate four years of rigorous college preparatory academics with four years of professional work experience. To learn more about Cristo Rey, visit the network’s website here. There was a time when, generally speaking, lawyers were not allowed to advertise. In my role as Marketing Director at Phillips Murrah, I refer to those days as “the dark ages.” This anachronistic tradition, a holdover from Great Britain, was a regulation enforced from within the legal industry via bar associations. On this particular day in history, Jun 27, 1977 to be specific, the U.S. Supreme Court decision in the case of Bates v. State Bar of Arizona marks an important development in the legal industry. The decision held that attorneys were to be permitted to inform the public about their legal practice through advertising. The backstory of Bates began with two young lawyers, John Bates and Van O’Steen, who placed an advertisement in the Arizona Republic on February 22, 1976. 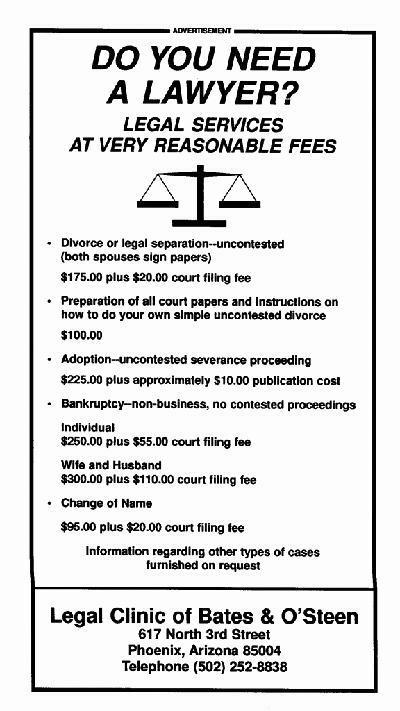 In the ad, they informed the public that they offered “legal services at very reasonable fees,” and included fees for various routine legal services such as uncontested divorce, personal bankruptcy and legal change of name. The motivation for this business model was to serve people of moderate income. The profit return was low for such cases, so they depended on increased volume to remain viable in their legal endeavor. After a couple of years, they concluded that their practice would not survive without the benefit of advertising their services and fees. This act put them in violation of the conduct rules of the State Bar of Arizona. The listener’s interest is substantial: the consumer’s concern for the free flow of commercial speech often may be far keener than his concern for urgent political dialogue. Moreover, significant societal interests are served by such speech. Advertising, though entirely commercial, may often carry information of import to significant issues of the day. And commercial speech serves to inform the public of the availability, nature, and prices of products and services, and thus performs an indispensable role in the allocation of resources in a free enterprise system. The assertion that advertising will diminish the attorney’s reputation in the community is open to question. Bankers and engineers advertise, and yet these professions are not regarded as undignified. In fact, it has been suggested that the failure of lawyers to advertise creates public disillusionment with the profession. The absence of advertising may be seen to reflect the profession’s failure to reach out and serve the community: studies reveal that many persons do not obtain counsel, even when they perceive a need, because of the feared price of services or because of an inability to locate a competent attorney. Indeed, cynicism with regard to the profession may be created by the fact that it long has publicly eschewed advertising, while condoning the actions of the attorney who structures his social or civic associations so as to provide contacts with potential clients. It appears that the ban on advertising originated as a rule of etiquette, and not as a rule of ethics. Early lawyers in Great Britain viewed the law as a form of public service, rather than as a means of earning a living, and they looked down on “trade” as unseemly. Eventually, the attitude toward advertising fostered by this view evolved into an aspect of the ethics of the profession. But habit and tradition are not, in themselves, an adequate answer to a constitutional challenge. In this day, we do not belittle the person who earns his living by the strength of his arm or the force of his mind. Since the belief that lawyers are somehow “above” trade has become an anachronism, the historical foundation for the advertising restraint has crumbled. Dave Rhea is Marketing Director at Phillips Murrah P.C. He may be reached at 405.235.4100. For the third year in a row, Phillips Murrah has been recognized as a Top Workplace in Oklahoma. For 2017, P|M was the only law firm listed as a Top Workplace, and was also recognized as the highest year-over-year improver of the list’s category of “Genuine Appreciation” among company employees. Phillips Murrah, an Oklahoma City law firm that employs 111, rose to No. 21 from No. 29 last year. The firm led improvements in the statement area, “I feel genuinely appreciated at this company,” up by 7 percent. Phillips Murrah spokesman David Rhea attributes his law firm’s gains to the company’s continued responsiveness to requests and issues as they arise. On December 10, The Oklahoman newspaper published their annual Top Workplaces list. In determining the defining criteria of Top Workplaces, The Oklahoman partners with the Philadelphia-based company, Energage, which evaluates companies across the country, pertaining to internal components of healthy workplace dynamics. Oklahoma’s children are back in school, but not every school kid has reliable access to a sufficient quantity of affordable, nutritious food. In Oklahoma, one in four children struggle with the detrimental effects of food insecurity. Phillips Murrah set out to be a part of the solution by helping feed hungry school children in our state. 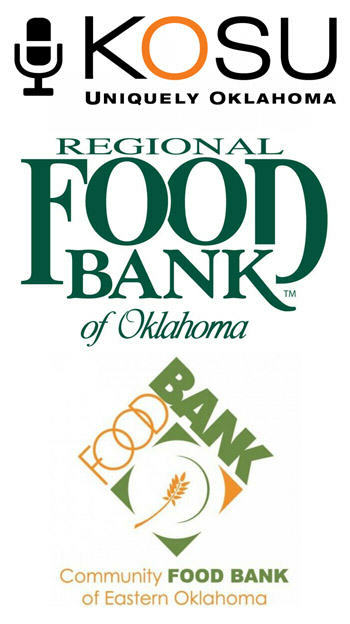 With this aim in mind, Phillips Murrah is proud to announce our Challenge Grant partnership with KOSU Radio, the Regional Food Bank of Oklahoma and the Community Food Bank of Eastern Oklahoma. With each pledge during KOSU’s Fall 2017 Member Drive on-air fundraiser, Phillips Murrah will donate the cost of a weekend food backpack for a hungry child to the Food Banks serving Oklahoma City and Tulsa, to be distributed by the Regional Food Bank of Oklahoma and the Community Food Bank of Eastern Oklahoma. If you would like to support this Phillips Murrah Challenge Grant, starting Wednesday, Sept. 13, call 855-808-5678 or pledge at KOSU.org. 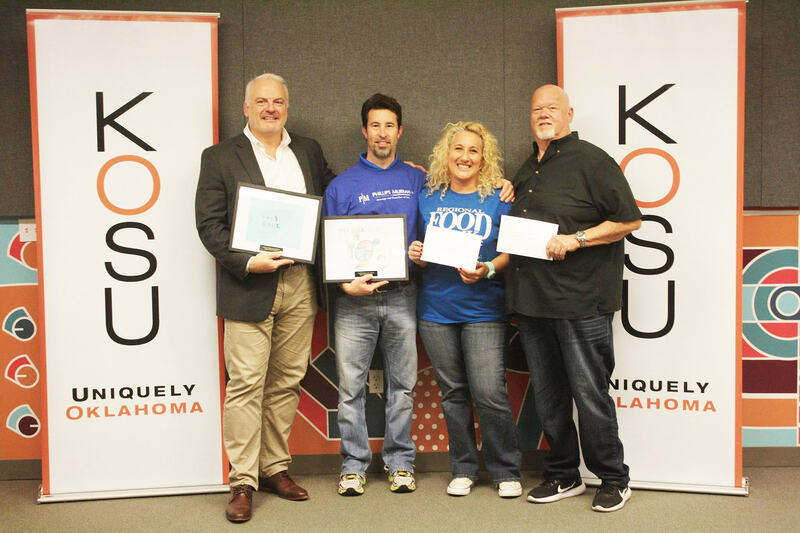 During the recent KOSU Fall Drive, Phillips Murrah donated $5000 toward weekend backpacks full of nutritious food for Oklahoma children in need. The Regionsal Food Bank of Oklahoma and Community Food Bank of Eastern Oklahoma will distribute the backpacks throughout the year through their Food for Kids programs. Pictures above from left: KOSU Station Director Kelly Burley, Phillips Murrah Marketing Director Dave Rhea, RFBO Director of Development Lisa Pitsiri and CFBEO Donor Relations Manager Ken Bacon. 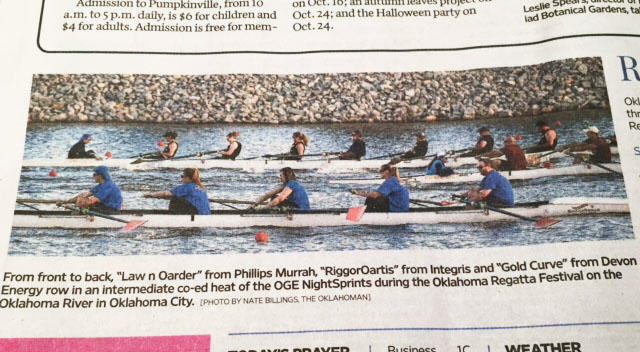 Phillips Murrah’s corporate rowing team, Law & Oarder, was featured on the cover of the Saturday, Oklahoman on Oct. 3. Getting ready for the race, Oct 2 at the Oklahoma Boathouse District. From left: Nathan Hatcher, Debra Tyler, Jennifer Miller, Jason Kreth, Dave Rhea, Melissa Gardner, G. Calvin Sharpe. 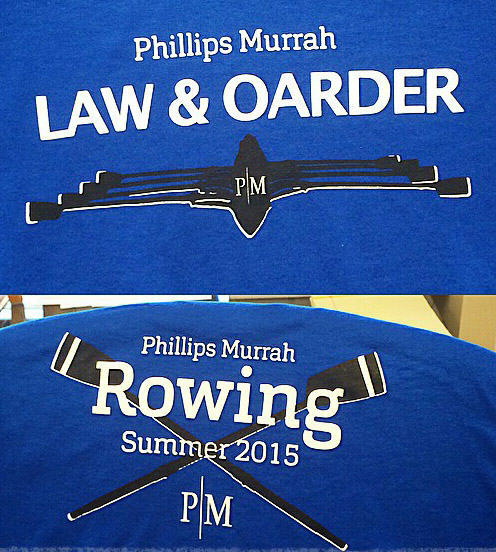 The Phillips Murrah rowing team, Law & Oarder, completed the 2015 season on Friday with a solid, 500-meter run of 1:52.818. 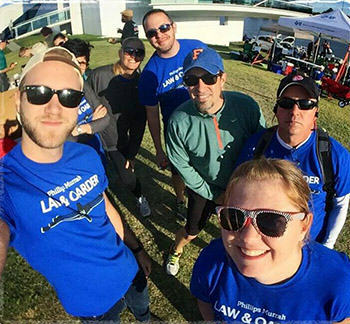 Over the two seasons during the summer of 2015, the rowing team has consisted of Firm Shareholders, attorneys, non-attorney directors in marketing and IT, legal secretaries and accountants. 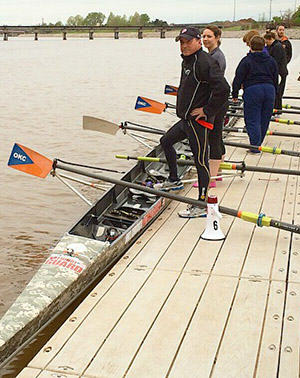 You can see more coverage about the regatta in The Oklahoman – Oklahoma Regatta Festival: Premier fall rowing event keeps growing by Ed Godfrey.